We had an old friend's gathering yesterday at one of the friend's 3-storey terrace near Singapore Expo. Initially, I was still quite ambitious to want to bake tarts, eclairs and cake. But ended up, I wasn't about to accomplish it. 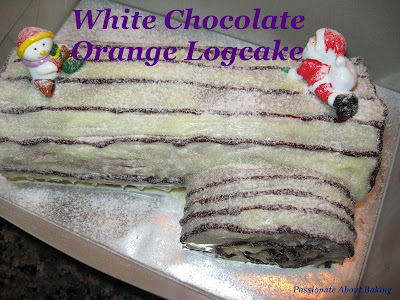 So I settled for logcake since X'mas is just round the corner. 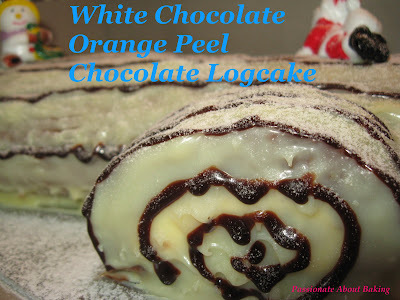 I would like to make a chocolate logcake. However, as I still had some white chocolate ganache and white chocolate with orange zest in the fridge, I decided to do white chocolate with chocolate cake sheet. I grated orange zest into the white chocolate, and used my caramelised orange slices as the fillings. However, I realised something when I was frosting the cake. Mistake #2: If want to frost a chocolate cake with white chocolate, you must cover the cake with a layer of whipped cream first. Then you can frost it with a layer of white chocolate without it being "see-through". As I was out to "impress", I just had to do it nicely. So I added a little of this, a little of that. And it turned out pretty PRO! ;) I am very happy with this "White Christmas Logcake". The white chocolate was sweet, but other than that, the sugar has been reduced for everything that was added! My friends were very very impressed by the logcake, thinking initially that I had bought it, until I told them it was made by me! They still thought I was kidding, until my spouse vouched for it. ;) My efforts were paid off-they were IMPRESSED! The log cake looks very cute. I like the santa and snow man. Where can I get these cute things? Thanks. I usually keep them from past years' logcakes. Or, my family members will pass them to me. You can buy them from supermarkets or Phoon Huat too! your log cake looks nice! I am not surprised that your friends are impressive! Love how fluffy the chocolate cake base looks! Haha i'm flattered, Jane but my log cake cannot compare to yours at all. Thanks a lot for your compliment! You're back already? Did you enjoy yourself while you were here? Did anything here changed since your last visit? what a nice logcake you've there! I attempt on making a logcake b4, not easy I would say.. 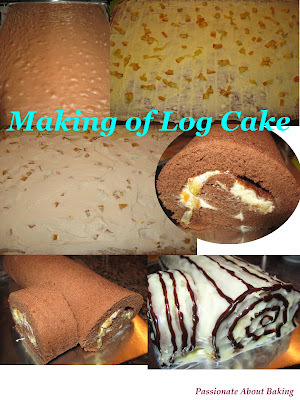 Very tedious process..
wow...your logcake looks pretty nice! i would love to make one myself too but im still looking out for the recipe of the cake. your rolls look nice...mind if u share your recipe for the cake? I used the emulsfied cake recipe from one of my post. You can find the recipe here: http://passionbaker.blogspot.com/2008/10/indecisive.html. If you want chocolate flavour, replace 20g of cake flour with 20g of cocoa powder. Do try it, it's not very difficult. Good luck & have fun!